Our Dance Studios in Long Island are quite unique. It has the ability to adapt to your every need. Its award winning design was drafted and implemented in 1985. After over 25 years the configuration has remained the same and continues to be used in all and every situation for dancing, private dance lessons, performances and dance tuition. 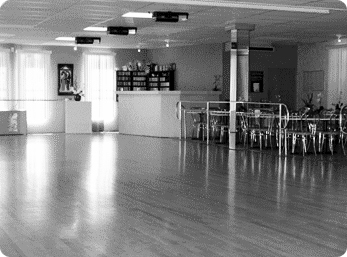 The dance studio is designed in an elegant and clean fashion. Its lines begin with a sprung Maple floor. This was accomplished by using the flooring company that helped design and build the floor at Lincoln Center and the Harkness ballet. When we need Marley flooring we of have a complete 30 x 30 portable touring flooring that we can use if we wish. The dance floor is the most important part of our space as it is what gives our dancer the ability to dance safely and happily every day. Our custom designed Ballet Bars… These bars made for stainless steel. As safety was important for us we used one of the manufacturers that designed railings for the US Coast Guard. The bars have 2 heights. There is one height for the younger kids, and another height for adults. They remain in the newest shape, as they are maintenance free. They can be kept clean and sanitized and keeps us in a healthy environment. The ballet bars blend in seamlessly with our décor and most of the time people do not even know what they are. Our Dance Studios were designed with teaching in mind, but equally important to us was performing. So we designed our space to be used as 2 large dance studios, when we need it. However, we do have one large space of 75 x 45 when needed for performing or large dance classes. We knew that when teaching, concentration was important for learning, so the divisions of our studio had to be done right. This is the reason that we had Panel Fold (a highly recognized partition door company) design our doors. They have a high STC rating, are steel framed, and have flooring seals to help to sound proof or studio from room to room. This door can be used to divide the space and is maintenance free. The door was designed to be the right size so it can put into place quickly and effortlessly. Our sound system is invisible. It has one home base in our custom sound booth. Our speakers have custom designed cabinets that match our décor so the space does not look like a production house or dance club. Our sound system was designed so that it branches out to either of our rooms or it can be used as a full sound system for our in house theater productions, or Socials that happen at our studio weekly. We only use the highest quality of broadcast sound reproduction equipment including our 32channel Soundtracs mixing console. This gives us the ability to hook up many of our live musicians that we may use at our events. Our sound system is second to none and very rarely needs updating as state of the art equipment lasts forever. Our studio lighting switches from class and general lighting, to full theater production, and for social dances and parties. Our lighting designer team many of which work for the Broadway theater section of New York helped us to design our lighting for shows as well as our evening events. We use quality lighting instruments from SGM, Martin Lighting, Color Kinetics etc. We designed our lighting plot to be multi functional. For stage work we can wash the entire studio space with color, or create an elegant design for our evening parties and social events. We create this atmosphere with our extensive collection of lighting instruments. Our lighting plot is computer controlled which enables us to either pre-program or design our lighting on the spot. With all of our options the dance studio atmosphere is one to be desired. 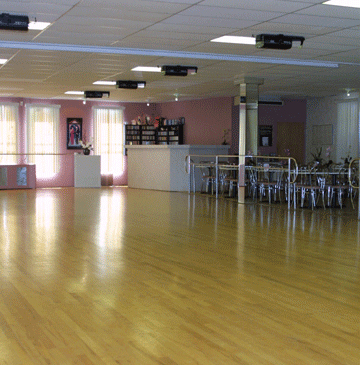 Our dance studio space has a 30 x 15 seating area adjoining each of our dance spaces. 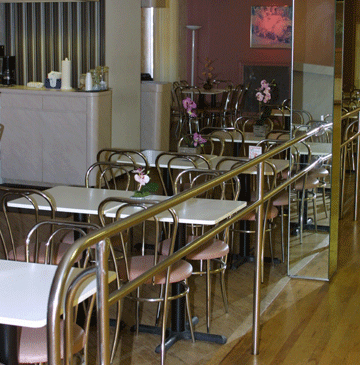 This area is complete with café style tables, with a matching décor for between the tables and chairs. The table configuration was chosen for the most flexibility in seating. We can accommodate 2, 3, 4 or almost any amount of people who wish to be seated together. This gives your group a chance to talk and enjoy the evening together if they wish no matter if it’s 2 people or 12. When it comes time to catering an advent the seating make an easy configuration for all to be able to get to the food and drinks easily. We do have a coffee station as well as one for soft drinks and water. When you sit in our Café area you will feel at ease. It will seem you are at an event and not at a studio at all. Along with our dance studio comes a DJ that can play the music you want to here. You may give requests or you are able to even bring your own music if it is something you would like to dance to. For or show performances we have the complete ability to edit pieces for our productions, including stage, shows, concert pieces, weddings or just about anything else. With every option at our fingertips our dance studio is uniquely designed to take on any advent in a way that will only enhance its presence. From Teaching, to Performing, to Socializing every detail has been thought through by our professional design team, making the Silva Dance Academy an absolute Adaptable and UNIQUE Experience!